Thank you so much for your prayers. During this hot season God's grace has enabled me to accomplish much. Only about 2 1/2 messages to finish. These will need more focused concentration because these are brand new articles I am writing. Each will be about 15 pages plus outlines and powerpoint. Do pray daily for the translator, Pastor J and his team. They have received outline after outline. The second series has numerous exercises that also need translation, which doubles their work. He requested that I work more slowly on the few remaining articles. He has so much to translate already! One seminar location was changed to a more stable place. Praise God for the coordinators in that area. The accommodations are better, safer and less expensive. 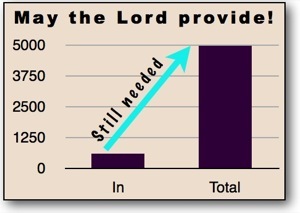 Do continue to pray diligently for finances for the India STM09. There is still a large need but little time left. A brother from the Philippines wrote a wonderful description of our ministry! I came back to your site just now to look for additional teachings on PERSONAL DEVOTIONS and found out you are offering your BFF Library for FREE. I would appreciate it very much if you can include me in your list of FREE BFF Library recipients. Allow me to introduce myself as PASTOR G, a full time pioneering pastor here in Metro Manila Philippines with some 50 members from seven families, 70% of which are children and with a special ministry to the visually impaired (blind) and their family members. While grounding our present membership in the word through personal devotions and aggressive discipleship mtgs among various age groups especially the HUSBANDS/ FATHERS, my wife and I felt like we should start an outreach with newly weds and are preparing a set of materials to start meetings with newly married couples. Three nights ago, I came across your website and found how helpful your materials are to our vision to raise up spiritually strong families that will bless the earth with their godly offsprings. Oh I almost didn't sleep reading through your materials on Godly Beginning for the Family, Biblical Parenting Principles, Training and Disciplining Children, and the Discipleship Materials, especially THE FLOW! How blessed I was to see how the RIVER is used as basis for your discipleship program! I recalled how the Lord led me to preach a message from Ezek 47 on the RIVER of God in the first month of 2009 and wondered, "How can I possibly have the BFF Library?" How I thank God for your timely OFFER to send it for FREE! Praise God that a little more has come in for the India trip. Preaching and teaching went well on the 16th. Several mentioned they were specially helped. Paul has accomplished so much preparation in these last two weeks. God is stirring the pastors in India. We still need over $4,000 for the India Seminar in September (2.5 weeks away). Pastor J. and his team are working hard to translate the outlines. He is getting married on Oct 10th. Paul leaves for India Sept 13th. He has to prepare the messages in his heart. Concentration and the Holy Spirit's help to finish writing 2.5 new articles. Please pray that the swine flu scare will not hinder travel or the seminars.